The Duke Takes Flight ~ Painting a bird in motion! After finishing my painting entitled The Duke of Queens Lake, I decided to paint two small paintings of the same bird (I will be blogging about The Duke in my next blog). The first of the two paintings I named Taking Flight. Taking Flight is all about capturing that moment when the bird is startled or has decided it's time to move on. For me the moment is bittersweet. On the one hand, I enjoy watching and photographing Blue Herons so much I hate for the bird to fly away. On the other hand, I find the taking flight moment exhilarating as a photographer/artist. Many times I miss the shot, but this time I was very happy with the outcome. I worked at darkening down the heavily wooded background enough to give it a density. At the same time, I worked at giving the woods an airiness by lighting up the leaves. I tried to put a spotlight on the bird, so to speak. In order to help accentuate the movement in the large wingspan, I used quick dashes to create the leaves closest to the bird. 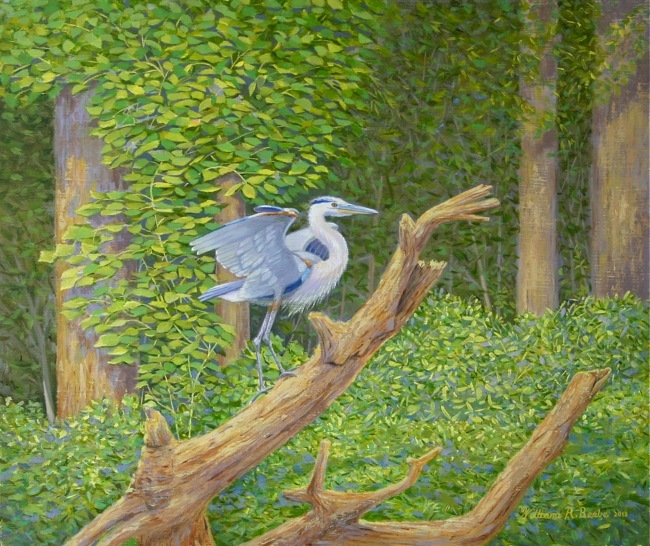 In the second painting, Vantage Point, the bird appears more out in the open, with the deep woods set back. The wild, ground vegetation is all highlighted by the bright sunshine. The Great Blue Heron is climbing to a better vantage point, surveying his territory. I like the way the darkest part of the woods encompasses the head and neck of the bird and makes the bird stand out prominently in the scene. The relationship between the bird and the wood creates a sculpture-like quality that appeals to me. They are companion pieces, both 10” X 12”. Both will be included in my upcoming exhibit at Seasons of Williamsburg on Friday, October 11th. They are also available through our website. I enjoyed painting them immensely and I thank you for letting me share my new work and passion with you!